Ayyy... it's Monday! Today we get a strange rhyming theme of phrases including the sounds "ay" and "it." SAYITAINTSO, PAYITFORWARD, MAYITBE, LAYITONTHICK, and PLAYITBYEAR. It's a little odd, in my book, and I've never heard of the song by everyone's favorite new-age crossword darling, Enya, so I wouldn't say it really wowed me. Let's start up in the NW, where we see four names, one abbreviated bacterium, an inflected verb dependent on a helper, and a plural bread (C-). SAYITAINTSO! At the very bottom, we find INDEPTH (24A: Comprehensive, as a report) (or a review of a crossword quadrant), which I like well enough. In other areas things get better. ASPARAGUS (33D: Spears at the dinner table) is delicious, and it's nine-letter partner STAYALERT (34D: "Keep your eyes open!") is fine. Opposite those, ENUMERATE (12D: Make a list of) (my favorite entry today) and TUNASALAD (11D: Popular sandwich order) really spice up that NE. I like the shout-out to the Clean Air Act at 23- and 25-Down, and there are a few other bright spots - CEASE, TEMPTS, FIEND, and RAVEN (Poe poem that starts "Once upon a midnight dreary," with "The"), though the clue for that last one is a bit tortured. 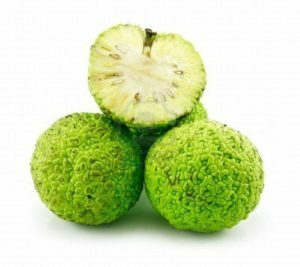 Overall, I didn't love it, but I learned a lot about an OSAGE orange (above) and so that's nice. It's named for the Native American tribe who used the plant's wood for bows. I also learned that it's got the highest BTU rating of any North American wood, and that it's harder than white oak. Oh, and one last thing - it's only a very distant relative to a normal orange. Fascinating! Went super fast. The theme is super slender (although there's a lot of it). It was super okay. The OSAGE looks neither orange-y or tasty. I don't believe I've ever walked by one in the Market Basket, and I usually look at the exotic fruits, often trying one or two. C- seems a little high for PITAS; Horace must've been in a good mood, despite the thrashing he gave to much of the fill, which with I agree. I'm glad that nothing naturally exciting happened while we were in BALI. Lost a few seconds on spelling of (Winona) RYDER, and the fact that I never know whether it is MALI or BALI. On the list of things I should figure out if I want to improve.